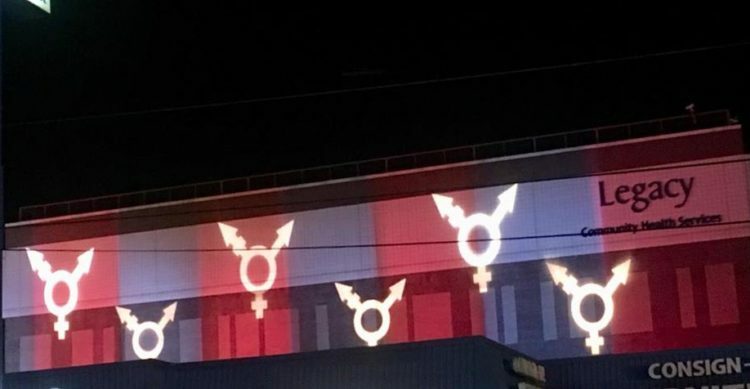 Pictured: The Legacy Montrose building lit for Transgender Day of Remembrance in 2017. Each year on November 20, we observe International Transgender Day of Remembrance. This year, Texas saw the murders of Dallas resident Karla Patricia Flores-Pavon and Brandi Seals, who was right here in Houston—and who was identified by the incorrect gender by local media following her death. Violence against the transgender community hit a peak in 2017, when at least 29 individuals were murdered in the U.S. in what is believed to have been hate crimes, the highest number on record. According to the National Transgender Discrimination Survey, 41% of transgender individuals attempt suicide at some point in their lives, and nearly 20% suffer abuse from a family member. Legacy honors the loss of Karla Patricia Flores-Pavon and Brandi Seals, and the twenty others who lost their lives to violence in the U.S. in 2018. This week, Legacy has lit our Montrose clinic location, visible from Westheimer, in honor of Transgender Day of Remembrance. Follow the movement on social media with the hashtags #TransWeek and #TDOR. Together, we can help to put an end to violence against the transgender community by remembering those we have lost and advocating for a better, safer future. For more information on the care and services Legacy offers to the transgender community, click here.